9:30AM - MON - Light snow contiunes to fly across Wisconsin. The storm trended even further south overnight clumping the highest non-lake effect snows near La Crosse through southwest Wisconsin, 5-8" expected there. This "clump" was centered south of the Mississippi River...this is very far south, the southern most possible route. Snow was not equally distributed into northern Wisconsin thus the lower totals there. Again, quite the jump from north to south with this system. Snow reports this morning. Snow ends tonight but lingers into Tuesday AM across the far east. In Door county lake effect snow is dominating. 13" reported in Ellison Bay this morning. Here is the my prediction for the rest of the event. Grand totals by the time we're done Tuesday morning. 5:00PM SUN - Winter weather alerts out for most of Wisconsin. 3-6" of snow for most, 6-10" near Lake Michigan in eastern Wisconsin by Tuesday AM. Forecast right on track. 18Z run was a hair lower on QPF amounts and fits the forecast nicely. Will be watching lake effect trends on Monday. Radar, warnings, and snow reports. Forecast is lining up nicely for Wisconsin. Radar shows snow is spreading west to east across Wisconsin. Light snow or flurries observed in southern and western Wisconsin. Up to 1" of snow already reported near the Mississippi River. Widespread 3-6" of snow accumulation, highest amounts near Lake Michigan in northeast Wisconsin due to lake effect. Snow will start this afternoon/tonight from west to east. 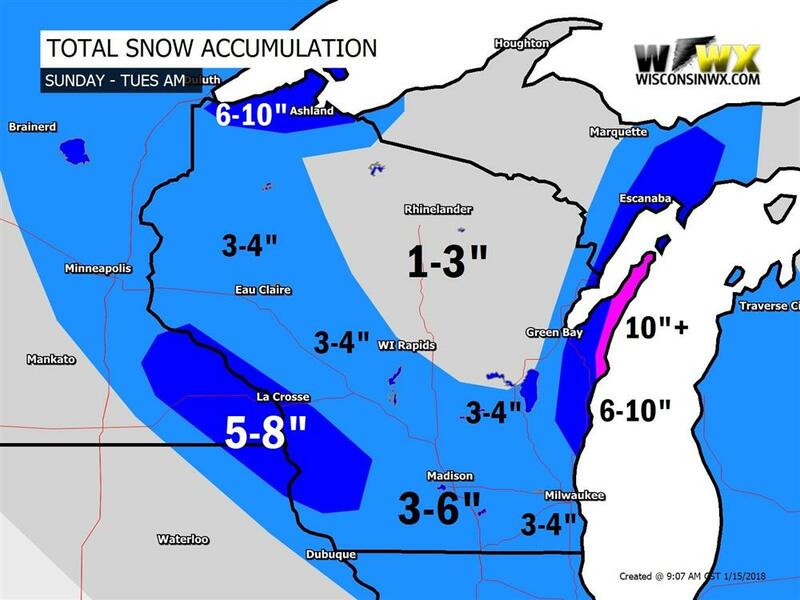 Latest forecast models now suggest 3-6" of snow accumulation for Wisconsin. 4-6" in southern Wisconsin near the low pressure track. Winter Weather Advisory's have been issued for the eastern two-thirds of Wisconsin. Lake effect will be possible near lake Superior in the north and along the lake Michigan shoreline in eastern Wisconsin, in both places 6-10" will be possible. This includes places like Sturgeon Bay, Two Rivers, and Manitowoc where a Winter Storm Watch is in effect. It is a similar story in far southeast near Milwaukee and Racine where lake effect snow may pivot inland late Monday into Tuesday boosting snow totals. With the shift in storm track, predictions in northern Wisconsin and upper Michigan have decreased to the 3-4" range. Radar and warnings at 11:35AM on Sunday 1/14. Snow will be of the dry character with high snow-to-liquid ratios of 20:1. Our forecast is at the top of model forecast guidance due to high snow ratios, deep and saturated snow growth zone, and long duration accumulation window. Forecast models are in above average agreement at this time but I'm not sure if that means anything with the shift we saw from yesterday. Accumulation from this storm will be relatively broad regardless of where the low goes therefore thought it would be better to broad-brush everyone with a 3-6". Following the snow on Tuesday, another surge of cold air is expected lasting into Wednesday morning but not quite as harsh as we've seen. Subzero low temperatures Tuesday night in the west, looks a bit warmer in the east due to cloud cover. Wednesday will start off quite chilly and daytime highs will struggle to reach the 20s. Low temperatures Tuesday night much colder to the west. Wednesday morning looks chilly! A weak warming trend appears likely late next week ahead of our next storm system next weekend. This system could bring a variety of precipitation types to Wisconsin. It is early and model simulations are split.